Arkansas Ludicrous Speed defeated University of Tulsa Party Fowl 11-3 in the first round of Big D in Little D on Saturday. 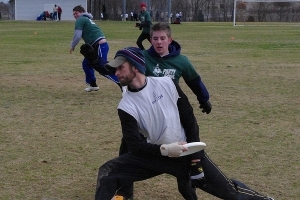 The game moved quickly out of reach for Party Fowl as Tulsa was unable to work the disc against the wind. Arkansas took advantage and the first half, 7-0. In the second half, Arkansas played their bench while Tulsa quit rushing their passes. This turn of events allowed Tulsa to go on a 3-1 run. Tulsa’s offensive prowess was short-lived however, as the game was hard capped at 11-3, with Arkansas scoring the final point.